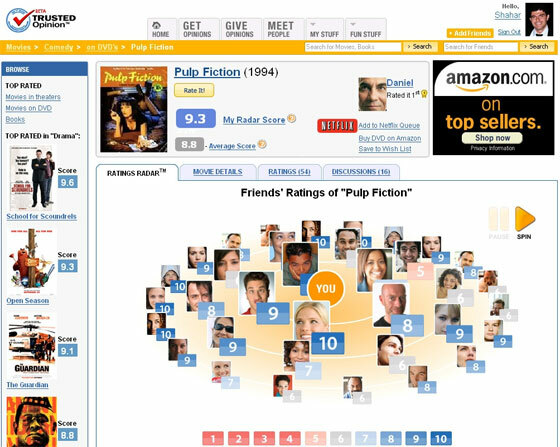 Social networking startup Trusted Opinion has added Netflix Queuing to their recommendations focused offering. The feature allows Trusted Opinion members to read a review of a movie then instantly add it to their Netflix queue without leaving the page. Although it sounds simple, Netflix does not offer a public API and hence the feature had to be created the old fashioned way, by creative programming. NetFlix does not currently offer a social networking service; Trusted Opinion sees the feature as being a draw card for Netflix members seeking new movies. We last wrote about Trusted Opinion in February. The site has had mixed results in terms of traffic since then in what is a hyper-competitive social networking market. Marrying an all you can eat movie hire service like Netflix to a service such as Trusted Opinion provides something that creates a point of differentiation. The feature will appeal to movie fans looking to find then hire great movies from a sea of Hollywood mediocrity.